The two bedroom two bathroom unit features 1510 sq ft of beautiful living space. The unit features a King in the master and two fulls in the second bedroom accommodating up to six guests comfortably. 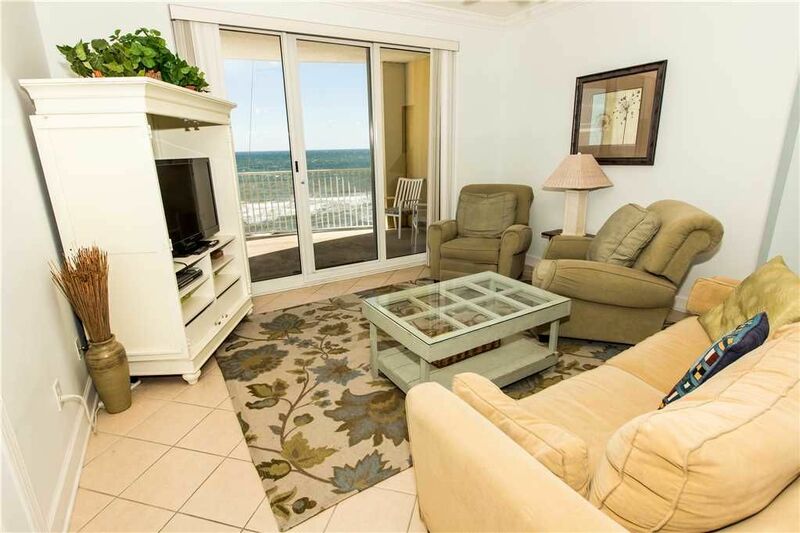 The private furnished balcony offers a majestic view of the spectacular sugary sands of the emerald coast. All condominiums have fully-equipped kitchens, linens/towels, starter kits of coffee and toiletries, clock radio, iron, dish soap, laundry detergent, and washer/dryer. Enjoy high-speed Free WiFi, TV with premium cable channels, and DVD player. The Emerald Isle Home Owners Association charges a $20 per parking pass fee for parking on property. If you need more than one pass please let your booking agent know so it can be added to your stay. Hello and welcome to beautiful Panama City Beach. My name is Daniel Caron, I'm the General Manager for Sterling Resorts at Splash and Emerald Isle. I have been in the Hospitality Industry for the last 15 years, working from small Bed and Breakfasts to 500 room hotels and a little of everything in between. I grew up in this area, running up and down the snow-white beaches, enjoying the lazy sunshine days and the calm atmosphere that you can only find here on the Emerald Coast. My team and I are located on-site at Splash (half a mile away) and our office is open 365 days a year to help our guests have the most enjoyable vacation experience of a lifetime. Our commitment is to ensure you and your family find the perfect vacation hideaway you can come back to year after year. From check-in, to housekeeping, to on-site maintenance; our team prides itself on delivering Sterling service to all of our guests. Welcome to our home, we hope you have as wonderful a time here as we do. We are always available to assist you, if you have any questions please don’t hesitate to ask! Ideally located directly on the Gulf of Mexico, this exciting condominium tower in Panama City Beach offers gorgeous views from the private balcony in every unit. Emerald Isle is a unique luxury condominium in Panama City Beach. With an inviting decor, each of the 199 two bedroom/two bath units affords all the comforts of home with the luxury of being at the beach. Each fantastic condominium unit features a fully equipped kitchen, washer/dryer and DVD/VCR. To enhance your vacation experience, Emerald Isles' amenities include two fabulous pools (one indoor/outdoor and one outdoor) with a pool pavilion, barbecue grills and a hot tub. The exercise room faces directly out over the beach and Gulf of Mexico. We are a local area rental management company, there for any Sterling Resorts' guest needs that may come up: check-in/out, lock outs, maintenance, or anything else. Sterling Resorts has a vacation app to assist with check in, check out, local attractions, discounts and more. We also offer vacation rental travel insurance to protect your vacation and make sure you have options when bad weather or accidents happen. Check with our Sales Representatives for more information. We loved this place. Plenty of space for 5 of us, open, airy, clean. Management was very quick to respond to our questions (you need to park in the attached parking garage across the street, fyi). But the best part: the view! That huge balcony! I could have stayed out on the balcony and never left the apartment and been perfectly content. Overall unit is pleasant, bathrooms clean and roomy, nice view of the coast on 11th floor. We very much enjoy the PCB west area. A few things need attention by the owner: the balcony furniture is worn/rusted and one of the chair seat straps are broken, and the couch would benefit from a cleaning. Renters should also note there is no check in or VRBO assistant on site. This is done at the Splash property just up the road. Info was not communicated during booking, but discovered on my own. We love staying at Emarld Isle. Overall a very well kept establishment. Unit 1102 was no exception besides the carpets are in need of cleaning or replacing. But as always the stay was exceptional. Thank you for your feedback! I am so happy to hear you enjoyed your stay and made lasting memories. We truly hope to have you back soon! We had a great time at Emerald Isle.... The Condo # 1102 was very nice and the view is incredible. Not one complaint . We will definitely be back ... !! !